The world has never seen such political momentum to protect our planet’s forests. Around the world, 366 companies, worth $2.9 trillion, have committed to eliminating deforestation from their supply chains, according to the organization Supply Change. Groups such as the Tropical Forest Alliance 2020, the Consumer Goods Forum and Banking Environmental Initiative aim to help them achieve these goals. But it’s one thing to commit to eliminating deforestation – it’s decidedly more complex for global companies to actually do it. Around 70% of the world’s deforestation still occurs as a result of production of palm oil, soy, beef, cocoa and other agricultural commodities. These are complex supply chains. A global company like Cargill, for example, sources tropical palm, soy and cocoa from almost 2,000 mills and silos, relying on hundreds of thousands of farmers. Also, many products are traded on spot markets, so supply chains can change on a daily basis. Such scale and complexity make it difficult for global corporations to trace individual suppliers and root out bad actors from supply chains. Yet with emerging advances in technology and big data, deforestation is more easily exposed – and it’s more difficult for companies to turn a blind eye to unsustainable practices in their supply chains. 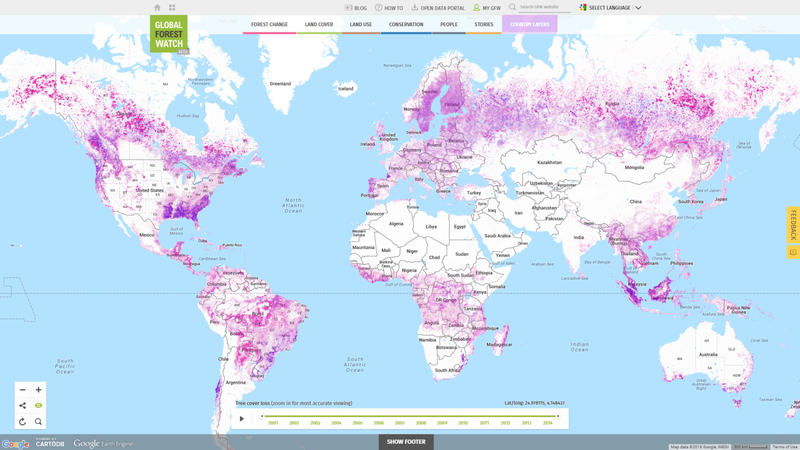 Global Forest Watch (GFW), a World Resources Institute-convened partnership that uses satellites and algorithms to track tree cover loss in near-real time, is one example. Any individual with a cell phone and internet connection can now check if an area of forest as small as a soccer penalty box was cleared anywhere in the world since 2001. GFW is already working with companies like Unilever, Cargill and Mondelēz in order to assess deforestation risks in an area of land the size of Mexico. Other companies are also employing technological advances to track and reduce deforestation. Walmart, Carrefour and McDonalds have been working together with their main beef suppliers to map forests around farms in the Amazon in order to identify risks and implement and monitor changes. Banco do Brasil and Rabobank are mapping the locations of their clients with a mobile-based application in order to comply with local legal requirements and corporate commitments. And Trase, a web tool, publicizes companies’ soy-sourcing areas by analysing enormous amounts of available datasets, exposing the deforestation risks in those supply chains. These efforts exemplify how big data can help tackle deforestation, but individual efforts still aren’t enough. To affect real change in the industry, we need to make the technology easy to use, globally applicable and fully accessible to smaller actors, while building on the experiences of pioneering companies. We also need to take into account the complexity and dynamism of the agricultural commodities markets. In other words, companies need to incorporate the issue into their core business strategy by monitoring deforestation consistently – the same way they would track stock markets. With those challenges in mind, WRI and a partnership of major traders, retailers, food processors, financial institutions and NGOs are building the go-to global decision-support system for monitoring and managing land-related sustainability performance, with a focus on deforestation commitments. Early partners include Bunge, Cargill, Walmart, Carrefour, Mars, Mondelēz, the Inter-American Investment Corporation, the Nature Conservancy, Rainforest Alliance and more. Using the platform, a company will be able to plot the location of thousands of mills, farms or municipalities; access alerts and dashboards to track issues such as tree cover loss and fires occurring in those areas; and then take action. Similarly, a bank will be able to map the evolution of deforestation risk across its whole portfolio. This is information that investors are increasingly demanding. With the click of a button, a decision-maker will be able to prioritize certain geographic areas to fight deforestation where it is needed most, such as by certifying sustainable operations, partnering up with local communities or buying from producers who are sourcing from areas using sustainable practices. Such technology will also generate business opportunities by, for example, allowing trading companies to identify the geographic concentration of their operations or enabling financial institutions to create new green credit lines. This new initiative will differ significantly from other tools. It will not only be a source of information, but a fully operational management system. It will “speak the language” of the target users, from the CEO of a bank to a farmer cooperative. We already understand the need to combat deforestation in order to protect natural capital, curb climate change and sustainably feed the world. The political will is there. Now it is time to use the power of information technology to meet those goals, involving all types of actors while also generating sustainable businesses opportunities. That could really change the world. Authors: Andrew Steer is President and CEO of the World Resources Institute. Luiz Amaral is Global Executive Manager of Global Forest Watch, Commodities & Finance.